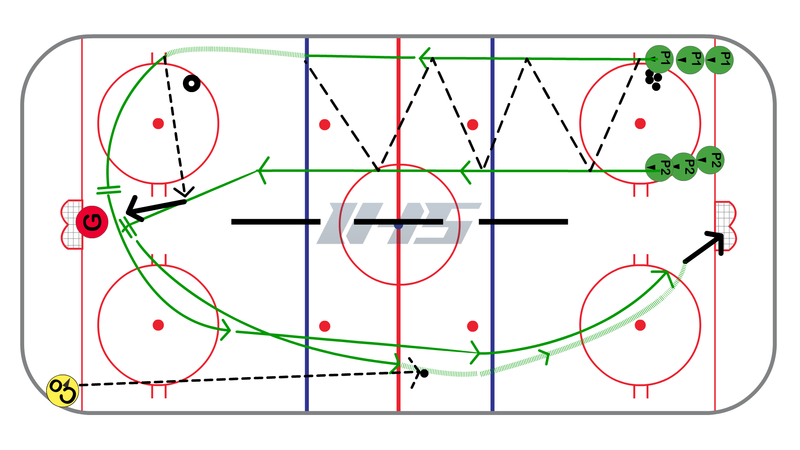 This full ice hockey drill incorporates passing and 1 on 1 competition. To set up the drill split the ice into half using barriers, cones, or tires. The players will line up in two lines in one corner of the ice and one of the lines should have a pile of pucks. Place one coach in the opposite corner with pucks as well. On the whistle the first players in line will go down the ice making as many passes as they can. Once they get to the far blue line the player on the outside will hold the puck and go around the tire. The inside player will drive hard to the net and look for a pass from the outside player. Both players will stop at the net. Once both players have stopped at the net the coach will play a second puck into the neutral zone. Both players will compete to get to the puck first. The player that gets to the puck first will attack the net and the other player will play defense and try to prevent a shot on net. do not rush the 2 on 0, make as many passes as possible. inside player skates hard to net with stick on the ice. if inside player is on their off-hand then they should open up for pass. The player that ends up on defense in the 1 on 1 needs to take a good angle to try and cut off offensive player as they go to the net.